Top o’ the Mornin’, etc. So am I going to hide a pot of chocolate golden dollars or leave a trail of green glitter on the floor? Ummm, no. Stop the madness, people! Seriously, do you ever look at Family Fun and think, God I long for the days when mothers just shooed kids out of the house to go play instead of doing endless freaking enrichment activities? When I was a kid, St. Patrick’s Day was like a punishment. People tried to pinch you and then your mom would make corned beef and cabbage for dinner. Okay, I don’t mean to have such a bad attitude. I love some crafty, cooking fun. It’s just that, then I tucked J into bed, and she asked, “So is this the night that leprechauns come out and roam the earth?” And all I could think was, really? When did this become another holiday that involves scheming after bedtime? Because after bedtime, I am done. I need to clock out and vegetate, thank you. And I know, I know. How hard would it be to dye the toilet? But why would leprechauns suddenly dye our toilet? There would have to be some sort of context. And then I’d be setting a new precedent, and next thing you know I’d have to come up with something clever and green every year. No. I won’t do it. Apparently J’s class made leprechaun traps at school, and J’s particularly thrilled because her group decided to go with her “rainbow slide to nowhere, sucka!” design. She’s convinced that a leprechaun, gold, and glory will be waiting for her in the kindergarten classroom tomorrow morning. Well, I don’t know about that, but we did, at least, determine that each girl has somethin’ clean and green to wear. 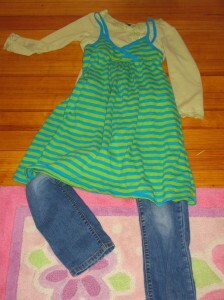 As is her custom for special occasions, J laid out her clothes. She might not acquire any gold, but at least she’ll be stylish. Meanwhile, in the time I took to write this post, I could have dyed some toilets and crafted up some St. Patrick’s Day themed crap. I’m doing that silent laughing thing with tears rolling down my face, to avoid breaking the facade for my husband in the other room that I’m in here working. Preach it sister. As someone who doesn’t drink, I just don’t *get* St. Patrick’s day. I mean, is there more to it than dressing in green, eating corned beef, and drinking? Apparently my son’s pre-k has been talking it up quite a bit too–he told me tonight to make sure we lock to doors so leprechauns don’t get into the house. St. Patrick’s Day is now like all other holidays in the US….#1 activity? getting drunk. The SUNYA riot was disgusting…but I bet the parties tomorrow night will be worse. I see this trend on Valentine’s Day and Cinco de Mayo, too. My kids asked why they don’t come to our house and I said we didn’t make them angry. My friend does this crazy turning the house inside out the night before. Yeah, I’m too exhausted. Though I love me some corned beef and cabbage (we fry it). It is exhausting, I agree. Having a preschooler and first grader come home talking non-stop about making traps, making plans, etc… to catch the Leprechaun that everyone is telling them will try to wreak havoc on their house while they sleep! However, the pure joy they have inspires me and gives me energy to do the silly traps and dye the toilet water to show the little devil “pee’d” in their toilet! The shrieks and joyous laughs this morning surpassed Christmas Day. That makes my heart smile and it’s all worth it. P.S. I didn’t even spend a cent!! None of these mamas are saying that this is “their biggest problem”–it’s just a little kvetching from a bunch of moms who, I’m sure, feel pretty darn lucky with their lives and their kids. If people are inspired by the thought that their kids will remember all these details, that’s lovely. I’d rather come up with details that I think are inspiring, and the toilet just ain’t my cup of tea (although I’m glad your kids loved it, Jenn). When kids are super excited it’s infectious and wonderful, absolutely. If J had started talking about leprechauns 2 or 3 days ago, we’d have done something crafty. They’d even ho-hummed the St. Patrick’s Day stuff in the Family Fun. So, when J finally mentioned something after stories and kisses and lights out, I was like, now? Too late, sister! Well, J was thrilled to report about her leprechaun-trashed kindergarten class, but I was happy to let her teacher, who’s apparently a leprechaun enthusiast, take over for this holiday. I’m fine with them to have some non-mommy-engineered memories. And you don’t know M, but she was just messing with me. My kids absolutely don’t remember “the special attention to detail” for each day. By bedtime when I was chatting J up about school, she’d forgotten everything she’d gushed about a few hours ago. She’d gotten distracted by all those plain ol’ memories of reading and riding our bikes and swinging on the tree swing and tickling on the sofa. Sorry that this is so long. With comments like these, I always end up thinking, gosh, do I need to make it clearer that I love my kids to pieces? I’m feeling like a sucky mama. . . .
Katie you seem a bit defensive for some reason. I was merely stating that sometimes we do these little things that seem silly to us at the time because they can mean a lot to a little one. While your children might not remember each little thing you did for them today, twenty years from now they will remember that you did those things. No parent is perfect. We don’t all bake the perfect Christmas cookies or pick the prettiest Valentine’s project, we all just do the best we can to have fun with our kids and show them how much we love them. And for the record I never said that anyone claimed this as their “biggest problem”, just trying to put things in perspective. Also every Mom on here goes out of their way to make each day special…that’s why they care enough to read this blog and why you write it! Wow. You seem to have a hit a nerve with this one. Who knew? Did I ever tell you the story about when I was in kindergarten and Dad told me that the Irish painted their fannies green and walk down Fifth Avenue on St. Patrick’s Day? And since I was half Irish, I could paint one cheek and join the march? And then I, believing every word from dear Dad, repeated this glorious news in class and used the word “fanny?” And that Miss Stephens (they were all misses and Mrs. in those olden days) shrieked at me and I was severely chastised? So, yeah. I am with you on taking this holiday off the calendar. I’m so behind on blogs. I was SHOCKED that my son came home from school and asked if the leprechauns were going to do any mischief at our house and said his friends had seen them, yadda yadda yadda. I told him there was no way our dogs would let any leprechauns in the house. We’re Irish. We celebrate by wearing green. During the DAY.